Poor-man's multi-track: recorded layered songs by using two boom boxes -- one to play parts back already recorded and the other to record new stuff with it. There were some High School bands during these formative years -- pSYCHotic Episode, and another one we never gave a name. pSYCHotic Episode -- JC, Sean, Dustin, Nate (a bunch of covers, +we wrote one song -called Character Flaw). Other band -- Andy, Dustin, Matt, Austin, Mike...whoever else -- we played a lot of covers. Andy played BASS, Mike was guitars, Nate Drums and JC did vox and guitar. We played a couple of covers and a bunch of songs that ended up being "blue". We had a lot of concerts at college and it was a ton of fun. 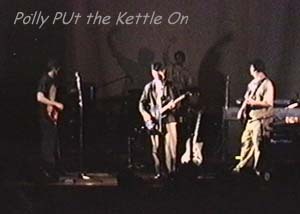 1997: Live band loses Mike and Nate - it goes away as all things do. Rob played bass, Dean played guitar, JC did vox and guitar and Dan played bass. One show. Nobody really loved it that much. Some parts were played by Nate and Rob (drum parts). The Album got pretty good reviews, but not a lot of them. Very little exposure. "Polly [PUt the Kettle On] is a one-man rock band out of Utah, with Simonsen writing and performing all songs.... Simonsen uses his lo-fi equipment to excellent advantage, creating lush and buzzy guitar soundscapes to accompany his emotionally-charged vocals and lyrics. The best track on the eleven-track album is entitled "The Next Step." It is an instrumental piece with Spanish-style guitars intricately interwoven into a music-box melody. Another excellent track is "Keep the Light," a song about a man trying to openly express his deepest soul to someone who is constricted with fear." "Blue and Contagion, are a style of music that no one has ever heard before. JC states some of his influences ... but his style is one all it's own. If you are looking for something new and different that you haven't heard yet ... then you should definately look into [the] cds." "There's no lack of bass slappin' and wokka-wokka riffs here. Polly PUt the Kettle on specialize in funky rock with grungy, gravely vocals and an underlying groove." Patrick wrote a song called "Felt that Way" that we recorded. Patrick is now missing in action. If you are out there drop a line! Everything was done by JC except some help on the Vox from a friend named Julie (fyi: Julie Rocks). It was posted on the web and put up on mp3.com but not pushed due to lack of time. JC did vox and guitars, Dustin did guitars, Andy did Bass, and Rob did drums (Rob from 'blue'). We did some stuff from "blue", "Contagion", and some covers. We really enjoyed doing Epic by FNM. 2001: Started thinking about doing a promotional album called "Distorted Vision"
2004: JC releases "Between the Lines"
2008: After 4 busy years JC releases "One Man Screaming"
:) Already looking pretty good from where I stand!